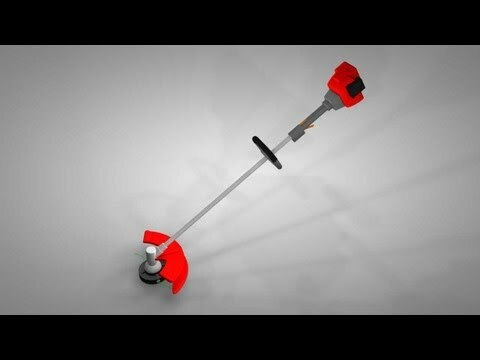 How does a string trimmer work? My string trimmer starts and then stops. What's wrong? What type of string do I need for my string trimmer? String trimmers enable homeowners to give their yards a well-manicured look. Proper maintenance will maximize efficiency and prevent problems. For greatest convenience, look for a tune-up kit designed for your string trimmer. In most models, fuel filters can be removed and cleaned. Some fuel filters are located in the fuel line and others are located inside the fuel tank. Be sure to consult your owner's manual for information about this. If you find debris clogging the mesh screen inside the filter, replace it. Located inside the string trimmer engine's muffler, the spark arrestor has an important role in the proper functioning of the string trimmer. It should be cleaned or replaced every 25 hours of use or once a season. Note that if your model has a fiberglass spark arrestor, it should be discarded and replaced every 25 hours of use, as this type cannot be cleaned and reused. Over time,the string trimmer line weakens, becomes brittle and easily breakable. Use a high quality, non-rounded string for a dramatically better cut. Before storing your string trimmer at the end of the season, spray a degreaser on greasy and dirty areas. Let it sit for 10-15 minutes before wiping the sprayed area with a clean cloth. Rinse it off and ensure that it's completely dry before storing the string trimmer. The spark arrestor may be clogged. This is often caused by using too much oil or the incorrect type of oil in the fuel mixture. Read your owner's manual to confirm what size trimmer string (a.k.a. trimmer line) is needed for your trimmer. Some common trimmer string diameters are .065" (1.7 mm) to .155" (3.9 mm). Professional landscapers use star, cross and square-shaped string. These shapes create cutting edges that enable you to move through an area significantly faster than with round-shaped line. A cleaner cut will reduce likelihood of browned tips.